If you knew that you had only one day to live, and then you would die sometime before midnight, would you not want to make sure that you would spend ETERNITY in heaven with the Lord? What if you were to die in less than a week, or a month, or even one year from now? 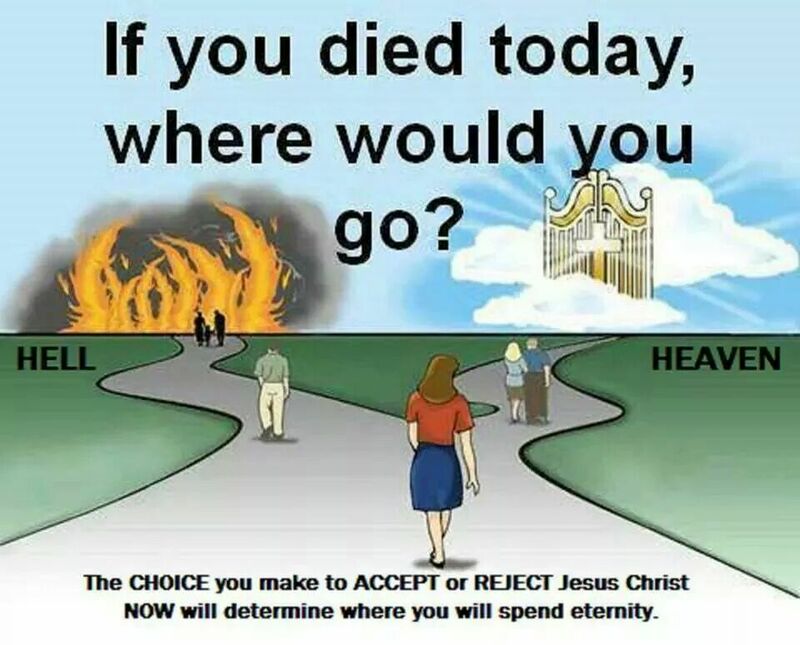 You would surely want to know where you would spend eternity. I have been blessed to see thousands come to Jesus Christ this year, but I have yet to have even one person, in any Country, say that they WANTED to die and go to hell. In fact, in 44 years I have only had two people say they were not afraid to go to hell, though they tried to convince me that they would have one continual party with their friends. Would you say to yourself, “It will be a time of Rejoicing in Heaven or will it be a time of immediate Regret, as you lift up your eyes in Hell? By the way, the Bible teaches that when a person dies they will immediately to heaven or hell. The basis of going to Hell is found in John 1:11:” He came unto his own, and his own received him not..” All a sinner needs to do to miss heaven is to simply reject what Jesus Christ did in becoming their substitute and shedding His blood as the only payment for sin on their behalf. The basis of going to Heaven is found in John 1:12: “But as many as received him, to them gave he power to become the sons of God, even to them that believe on his name:” To receive eternal life one must receive by faith that which Jesus has done on the cross. The question is not what did grandma say, or a preacher, or a neighbor, or even our Church. The question is “What does the Bible say?” No church, preacher, denomination, or Christian is being faithful to the Scriptures who teach otherwise. But these same churches don’t embrace eternal security! • There is not one person in the Bible ever saved, then lost. • There is not one principle that supports that false doctrine. • There is not one preacher or prophet that ever taught it. • There is not one picture that symbolizes losing salvation. • There is not one precept or passage that teaches you can lose your salvation. • There is not one provision for being saved again. What the saved has is not just until you sin, but forever and ever! John 3:36 – “He who has the Son has eternal life…” John 10:28 – “I give eternal life to them…” Notice the present tense in these verses. On the other hand Jesus told of the rich man who died unsaved “And in hell he lift up his eyes, being in torments” Luke 16:23. At the moment of a person’s death it is determined where they will spend eternity. Judgment for the lost is for the degree of punishment, but for the believers judgment is only for reward or the lack of it. The Bible is perfectly clear that the true believer has eternity security, and just as clear as to the condemnation of those who reject God. It is misled men and churches who have falsely confused the matter. Verses 9-10 states seven times that believers are given to Christ, by God. Jesus made the point that believers are God’s, h so how can they be lost? Verse 12 emphatically states clearly none are lost and that Jesus keeps His children saved! What does everlasting life mean? Jesus said, believers are given eternal life and no one can pluck them out of My hand. It is God Himself that keeps the believers saved! That is His promise to those that believe! John 10:27-29. We have the testimony of the New Testament. If the Lord Jesus Christ, who is the Savior, says once a person believes and is saved has eternal life, how can anyone call Him a liar and say that eternal life is not eternal life? Note Paul’s says he KNOWS, and is PERSUADED that GOD, (not Paul) would keep that which he had committed to Him. Paul believed God’s promises of salvation, and Paul accepted and committed his soul to God. Paul was absolutely sure he had been forgiven and was saved. Paul knew too, that he was not sinless. He said “This is a faithful saying, and worthy of all acceptation, that Christ Jesus came into the world to save sinners; of whom I am chief” I Timothy 1:15. He said he was the chief of sinners, yet God forgave him all his sins past, present and future the day that Paul believed. Romans 8:1, God tells us through this passage, “there is therefore “NOW” no condemnation to those who are in Christ Jesus. That word “now” is an important word. “Now” refers to the period after one believes, meaning after a person believes in Christ, there is no longer any condemnation. Why? Because God has forgiven him. What a great absolute assurance God gives us in Romans 8:31-39. “What shall we then say to these things? If God be for us, who can be against us? He that spared not his own Son, but delivered him up for us all, how shall he not with him also freely give us all things? Who shall lay any thing to the charge of God’s elect? It is God that justifieth. Who is he that condemneth? It is Christ that died, yea rather, that is risen again, who is even at the right hand of God, who also maketh intercession for us. Who shall separate us from the love of Christ? shall tribulation, or distress, or persecution, or famine, or nakedness, or peril, or sword? As it is written, For thy sake we are killed all the day long; we are accounted as sheep for the slaughter. Nay, in all these things we are more than conquerors through him that loved us. For I am persuaded, that neither death, nor life, nor angels, nor principalities, nor powers, nor things present, nor things to come, Nor height, nor depth, nor any other creature, shall be able to separate us from the love of God, which is in Christ Jesus our Lord” (Rom. 8:31-39). I Peter 1:5 tells us it is God who keeps us saved, “Who are kept by the power of God, by faith unto salvation ready to be revealed in the last time.” One is not said to be kept by his works in which we all fail, but by the power of God.